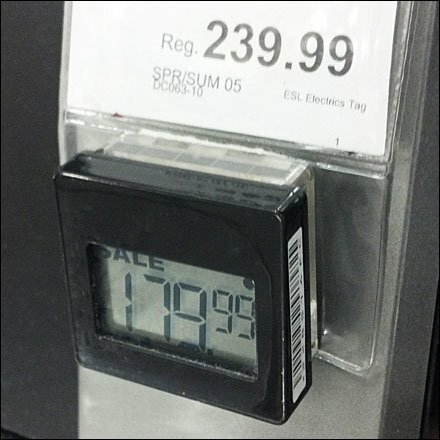 Electronic Shelf-Edge Pricing has been a possibly for years. It extends the benefit of instantaneous pricing, repricing and competition at the shelf edge … just as happens now on the gasoline pump and station roadside signs. Is the technology mature enough? Should you compete solely on the basis of pricing identical to your competition? If the wholesale price of purses (or coffee makers) goes up, should you echo the price change instantly to the shelf edge? You decide. I just show you one implementation. Note that the Digital Price Tag is used as a Bib Tag promotional add-on. The regular price and product features are communicated on paper. The promotional price is digital. Do you think the digital implementation adds a sense of urgency or immediacy to the purchase … implying as do roadside gas signs, that the price could and does fluctuate? 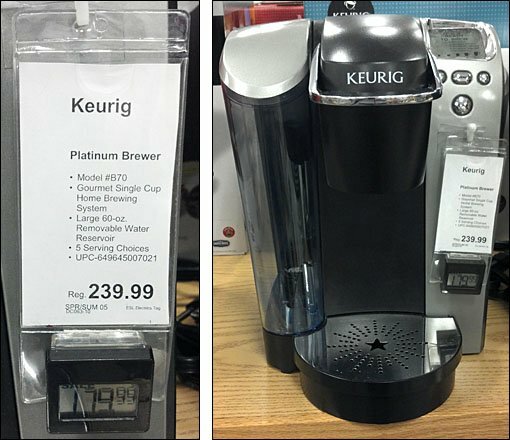 (By the way, this is a fairly standard discount on this model Keurig, available at other stores within a one-mile radius.) CLICK the thumbnail for a closeup. See the unit-identifying scan code label on the electronic tag.